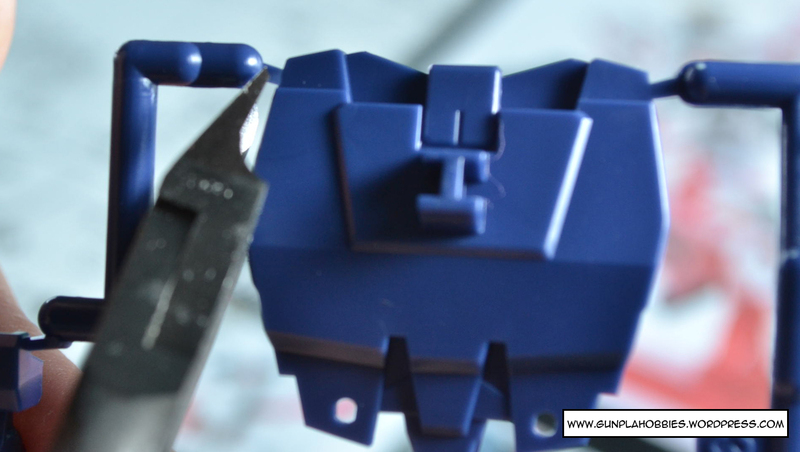 This page is to show how I remove nib marks on my Gunpla kits, there are a lot of other techniques out there and I can’t say mine is the best.We all have our own preferences and this is my technique in removing and cleaning out nib marks. Its quite simple and its an adaptation of two techniques. First thing to do is of course to cut the part out from the runners, what I do is I cut the part of the gate nearest to the runner as shown below. Why? 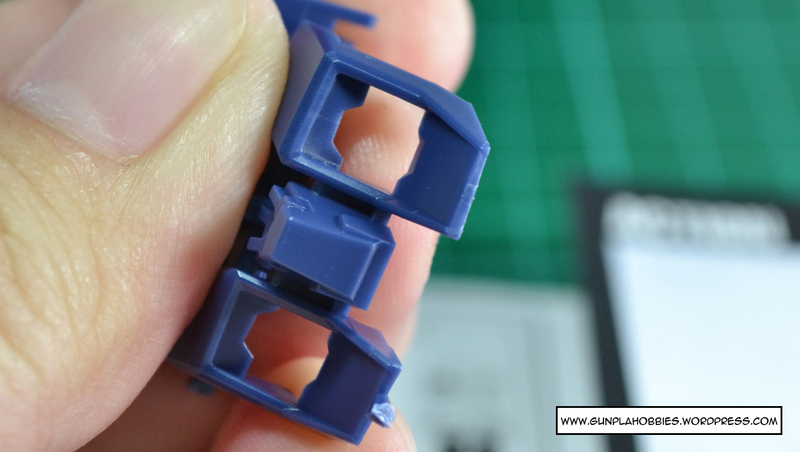 Its to leave a large chunk of gate on the piece so that I will have enough plastic to cut away little by little. I will explain this more in a bit. 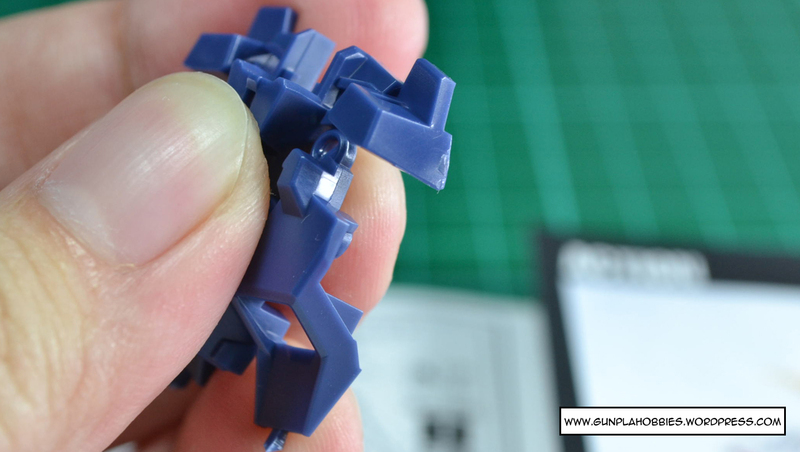 Before, I was cutting the gates nearest to the parts, but the problem is that most of the time, especially with dark colored parts like this one below, cutting nearest to the part leaves a white plastic strain/stress mark especially when your cutter is a bit dull already. So the first technique/trick that I use is to cut away the large chunk of gate left on the piece little by little and slowly using a sharp cutter, with this technique, leaving white strain/stress marks on the piece is prevented. 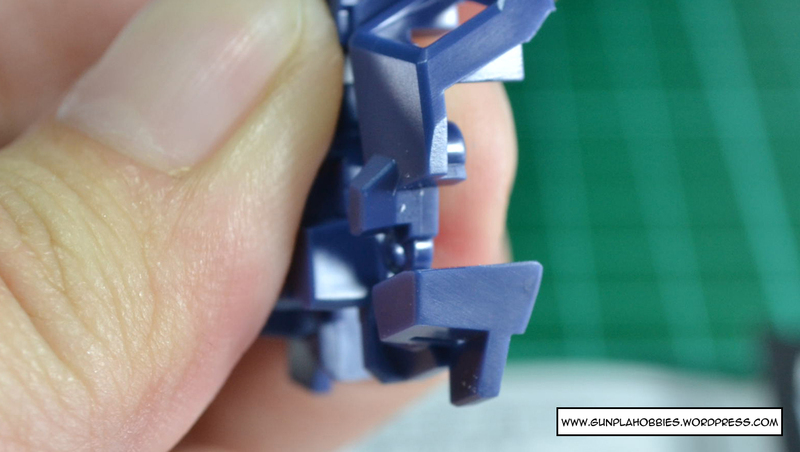 The trick is to leave a thin layer of gate on the piece and cut it last, logic behind it is that the less volume of the gate you cut, the less strain/stress is produced on the plastic, therefore prevents the white strain marks to appear after cutting. As you can see It is not 100% successful and it takes practice to get it done right. When this technique is unsuccessful, this is where the 2nd technique comes in. I’ll show it later. White colored parts are my most favorite pieces to cut since nib marks can hardly be seen. 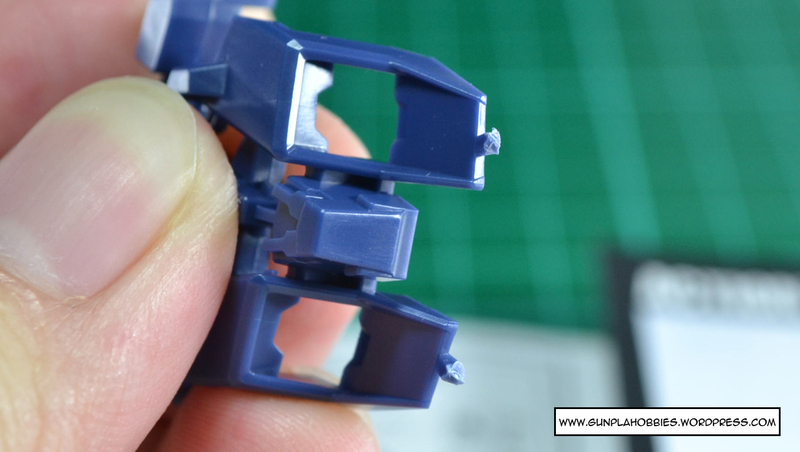 Now for the 2nd technique(when the 1st one fails), I resort to sanding, which is more tedious and takes time especially when building an MG kit. 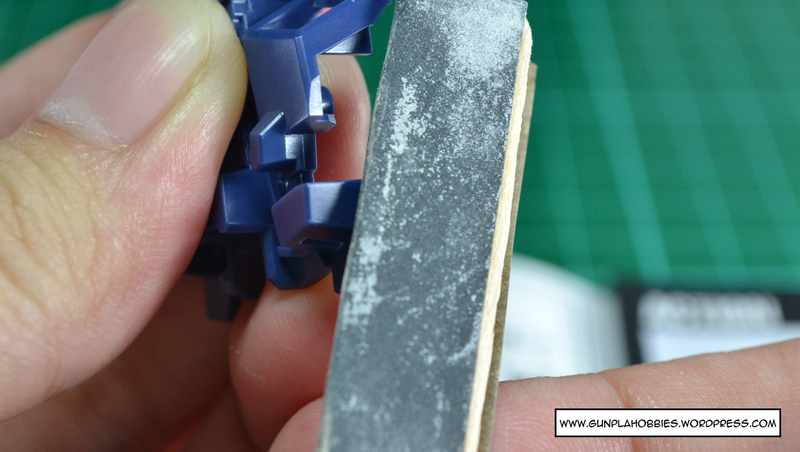 Sand paper comes in big sheets and it is hard to use such big sheets in sanding your Gunpla parts, even if you cut away a small piece of sandpaper, it is still hard to use since it covers a large area. 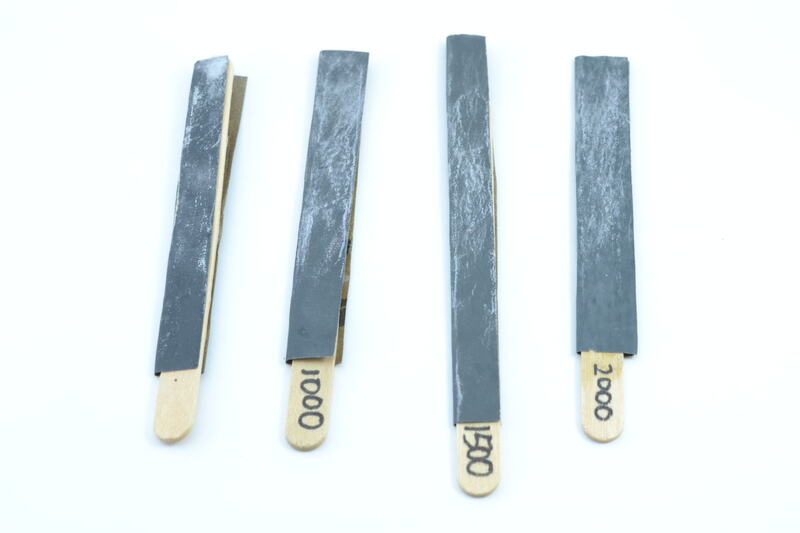 The solution is to make your own cheap sanding sticks made of popsicle sticks and strips of sandpaper. Its easy! Just cut two strips of sandpaper and glue it to the popsicle stick and viola! You have your own sanding sticks. 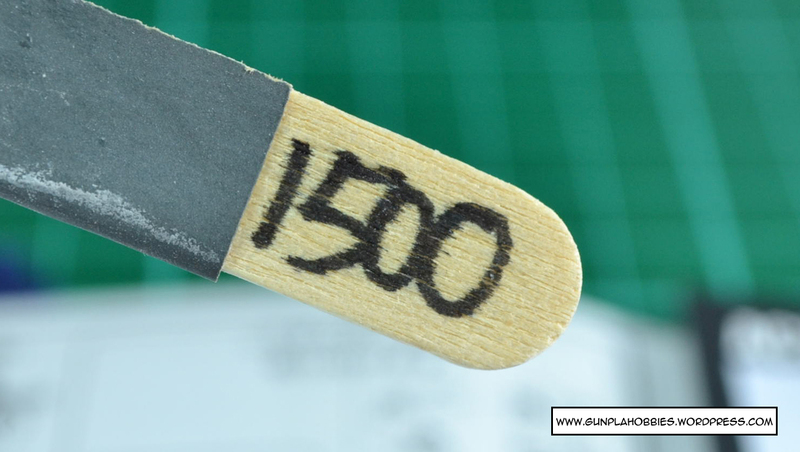 You might be wondering what those numbers on the popsicle sticks mean, well sandpaper comes in different grit sizes, grit meaning the particles that makes the paper abrasive! The larger the particle the more abrasive (and destructive) the sandpaper is! BUT DON’T GET CONFUSED! Grit designation number is actually inversely proportional to the abrasiveness and grit size of the sandpaper. What I mean to say is, the larger the GRIT DESIGNATION (the number printed on the back of the sandpaper) is, the smaller the grit particles are! Hence less abrasion, so don’t get confused! 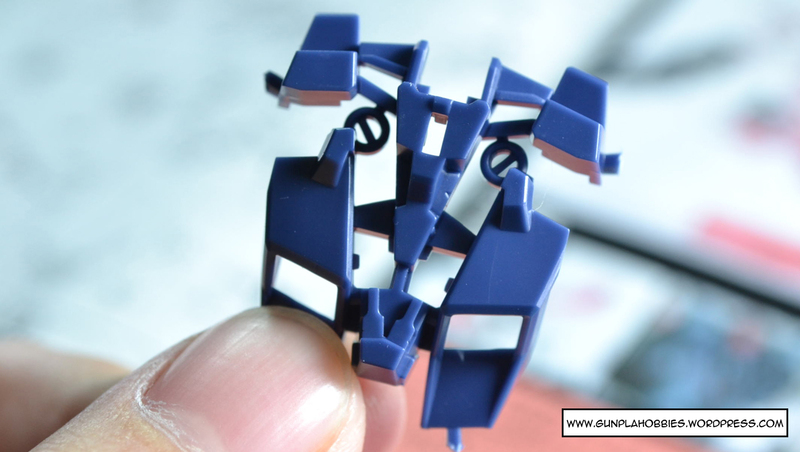 What I use for my Gunpla kits are the grit sizes of P800, P1000, P1500 and P2000. 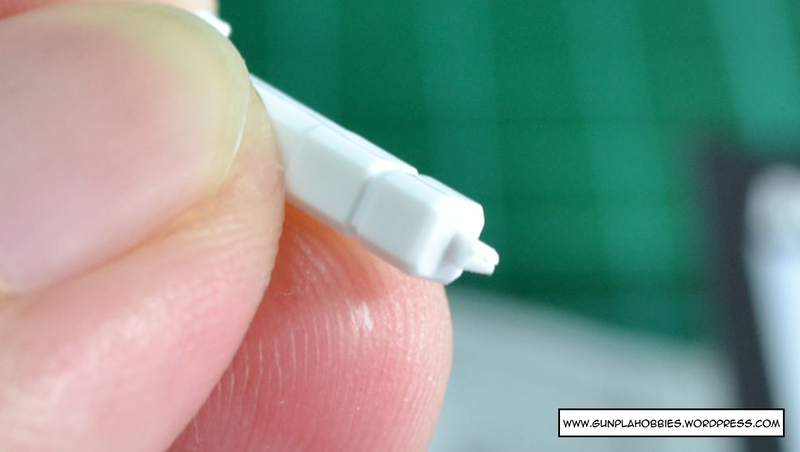 P800 is used for leveling the nib mark with the plastic surface, be careful not to overuse this grit size though as it really chews away the plastic! If you’re unsure then use P1000 in leveling the nib mark instead, although it might take a little bit slower than using the P800. 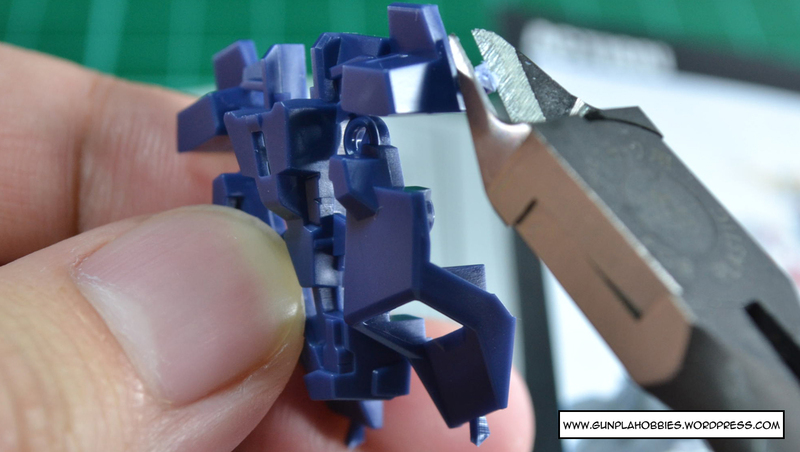 Using the P800 will leave hard scratches and makes the surface of the plastic rough as if you sprayed it with Flat/Matte Topcoat. 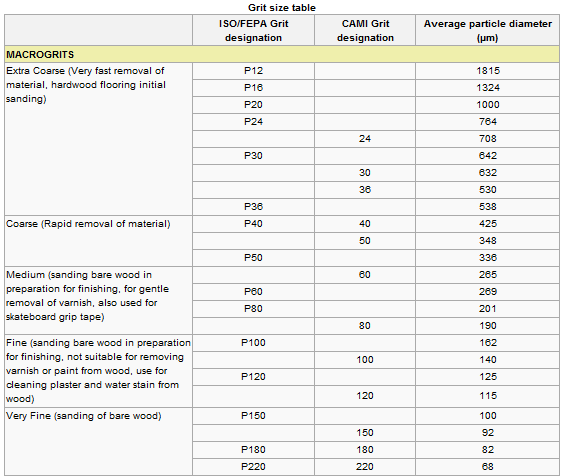 This is where the larger Grit designations (P1500, P2000) comes to the picture. 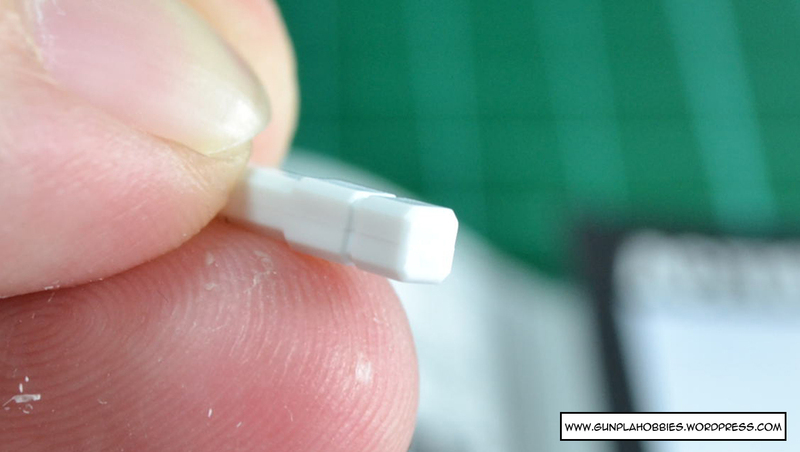 What the P1500 and P2000 does is to smooth the surface of the plastic as if you didn’t sand it in the first place and make an even smooth finish.This is due to the grit size being very tiny! Microscopic even! Imagine P2000 having a grit diameter of only 10.3 micro meters! 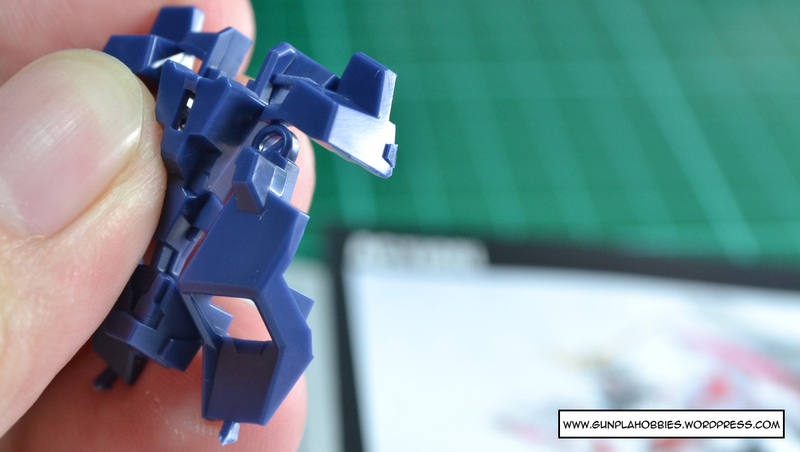 This is quite useful if you want to keep your Gunpla kit shiny and if you plan to spray it with Topcoat Gloss. 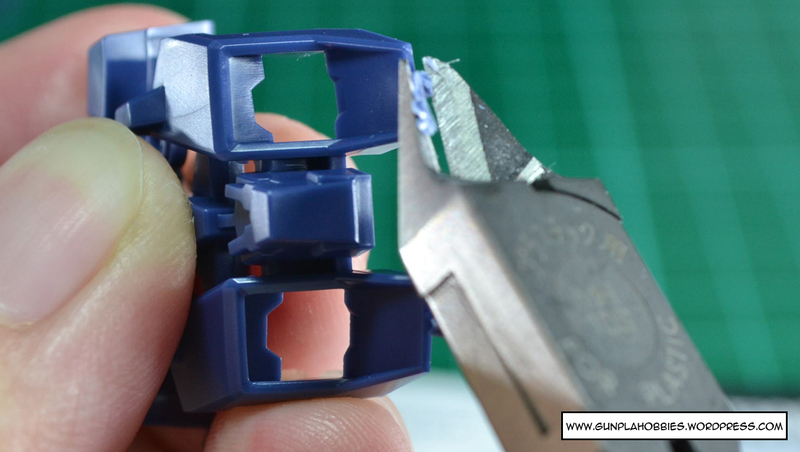 That’s it on how to (well I) remove nib marks! 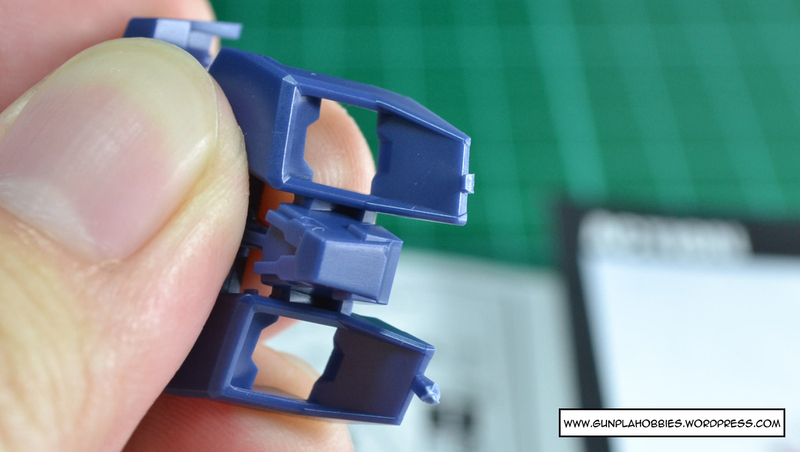 Hope this helps those who are just starting to build their Gunpla kits! Remember there are other techniques out there that might be faster or better, but I stick to this two techniques where I am comfortable with. 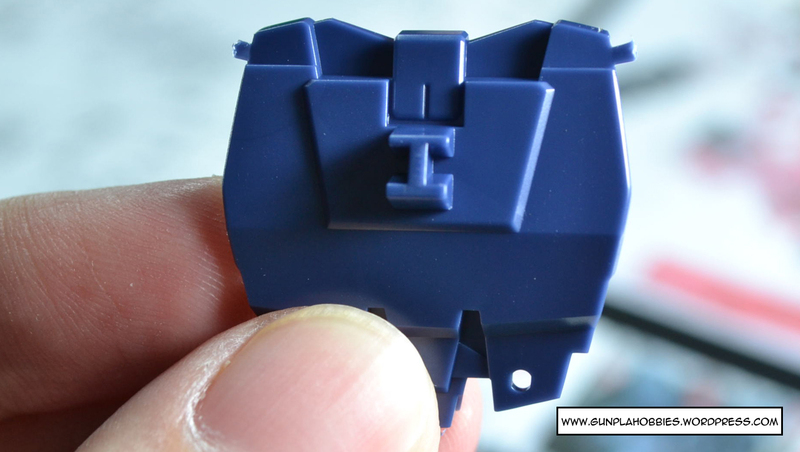 How do you keep the part from getting deformed? 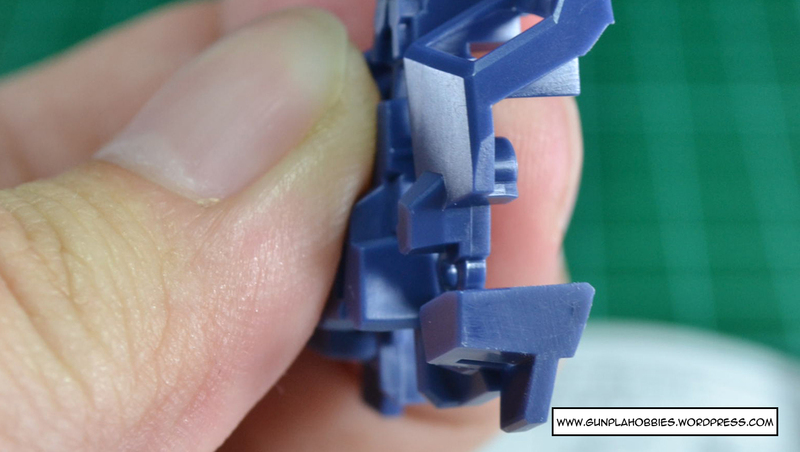 I just did my 1st sanding on my HG Xiphos, the sprue was located at the curve edge, when I used 1000 and 1200 it deformed the sanded portion. Also when I did mine it left a discolor between the sanded and unsanded part. How to keep these from happening? 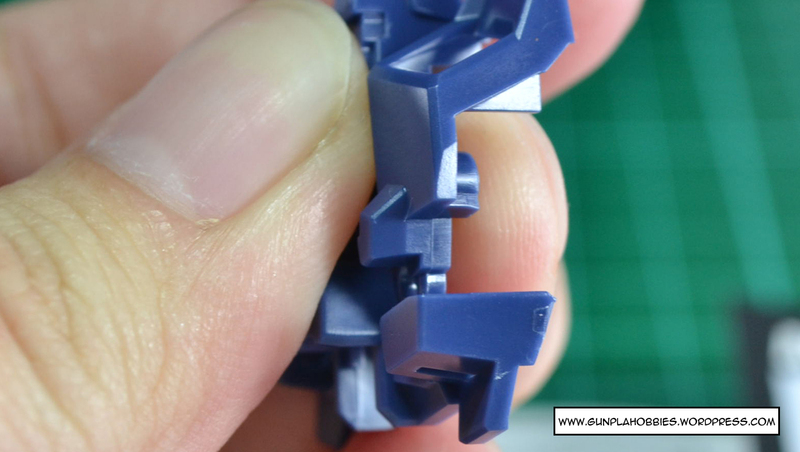 To avoid deformity, you just have to be careful in sanding curved parts and use sandpaper with the higher numbers like 2000 so that less plastic will be sanded. Pwede rin yung gloss kung gusto mo gloss, I prefer matte kasi. 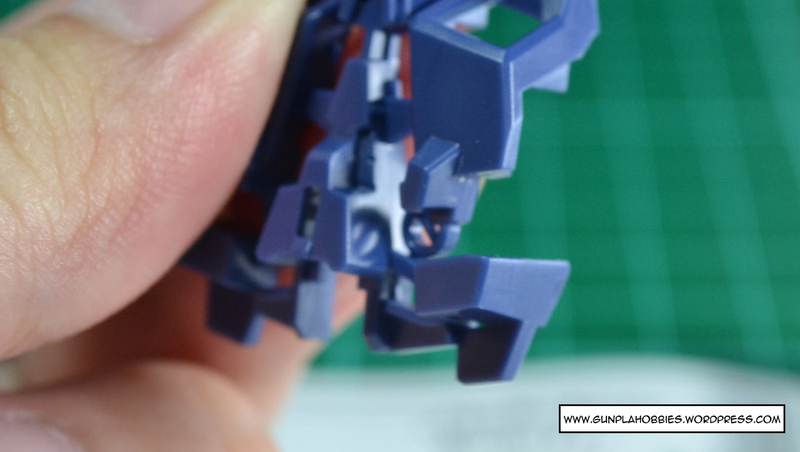 Kailangan mag spray ka outdoors on a sunny day, don’t do it indoors or sa CR, and spray ka around 8 inches to a foot away, then sa pag spray, hindi ka magsisimula sa gunpla mismo, simula ka sa empty space sa left side ng gunpla then spray pa right lagpas nung gunpla para walang spurts mapunta sa gunpla. Isang coat lang muna, patuyo mga 3-5 mins then isa pang coat. Up to three coats ako usually for the desired matte effect. Thanks! This is really usueful. I had no idea how to get my plastic smoother after sanding the nub down. Looks like I’m going to go ge tsome 2,000 grit sandpaper for that! 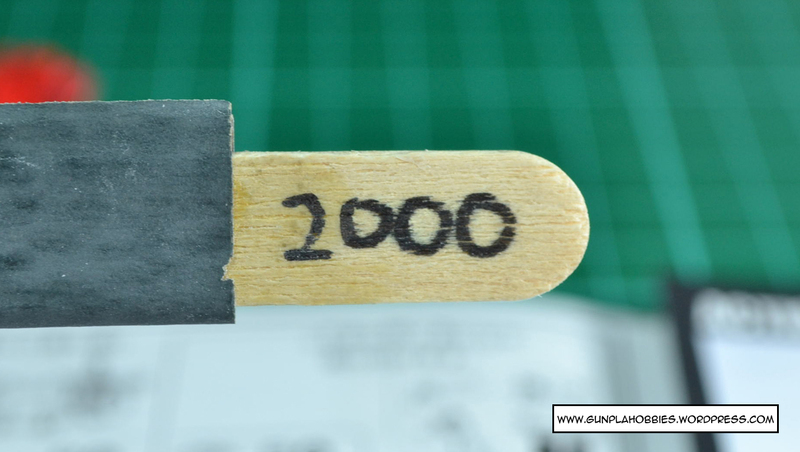 Can I use #1200 only to level and smooth the surface of the nib mark? Or must I use #800 and #1200 afterwards? I’m considering buying the Sand Stick #1200 at hlj.com (https://secure.hlj.com/product/PROKK-50/Sup), is that okay? 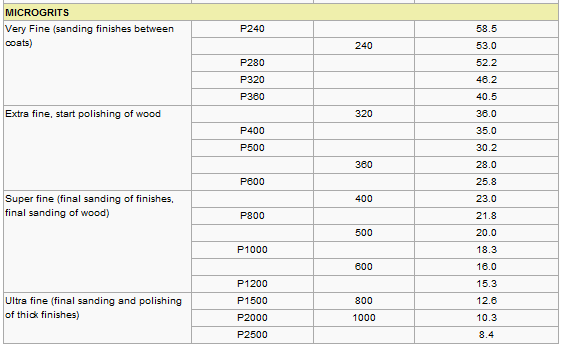 yes you can use 1200, though you will be sanding longer than using #800 to level the surface since it is lower grit. Ano Po Ba Ang Prefered Nyo Po Na Clear Coat? So this is how you do when sanding right?